In the middle of the way between writing and painting, Calligraphy is a total art, which is more and more used each day around us and because of the richness of our communication technology. 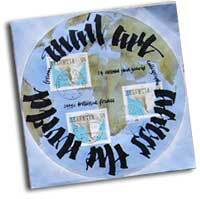 Mail-art gives a new life to usual epistolary communications by turning it into art and by the travel of artistic creations. That's in the 1st french-speaking calligraphy board on the Internet (http://encre-et-lumiere.com) and because of the meeting of calligraphers from different countries that "Mail art across the world" project is born. A new edition is organized every 2 years. In this area of exchange and ressource for all kinds of writing, we propose to build bridges between calligraphy lovers from all over the world to make rediscover to all this incredible art of beautiful handwriting.